There are many features of October CMS. I will be showing you one by one. 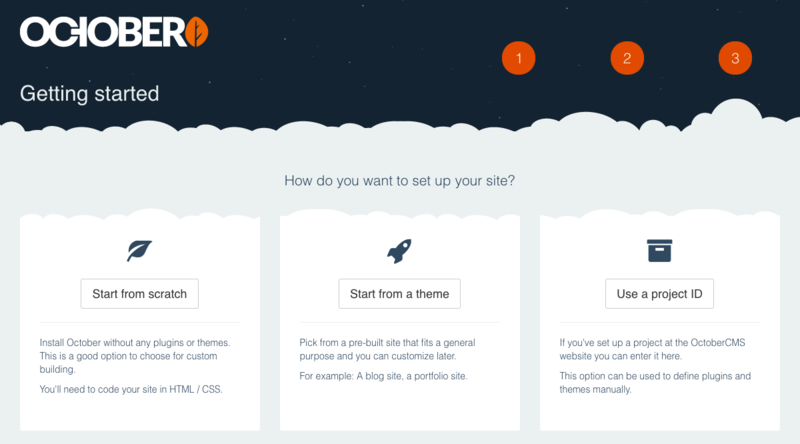 Twig is the simple templating engine, created specifically for web designers. It won’t slow down your app, and it automatically takes care of escaping and other tedious tasks. Components are the building blocks for Pages. Just add the component to a Page to add a new functionality and configure it with a Inspector. An Inspector is the visual tool for managing component properties. Extend the platform with Plugins that seamlessly integrate with October’s back-end and front-end. Plugin classes are elementary, and you can describe the Plugin and register the features that you want in October. Effortlessly create back-end interfaces for your plugins. Back-end pages require minimal PHP coding and use simple configuration files. The AJAX framework lets you efficiently bind the AJAX request to the form or a button. These requests can be handled by the components or by your code in a Page or Layout. First, you need to download the zip file from its documentation. You can find it on here. There are some system requirements. I am listing here. Now, after downloading that file, you need to place that zip folder inside your server root. If you are using localhost via MAMP or XAMPP, then your web root might be an htdocs folder. So you need to place that zip file inside that folder and now unzip them. Next step, is to permit the folder and its subfolders. 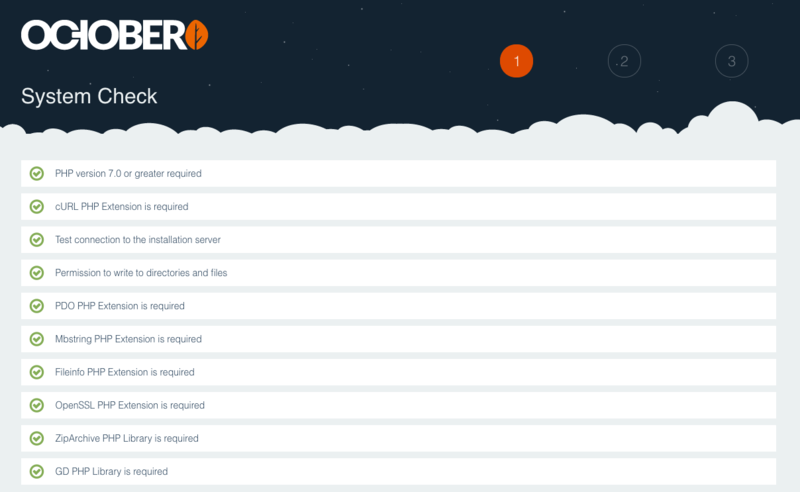 My OctoberCMS folder’s name is install-master, and yours might be as well. If you navigate to this URL, then you might see the below screen. Click agree and continue to the next step. 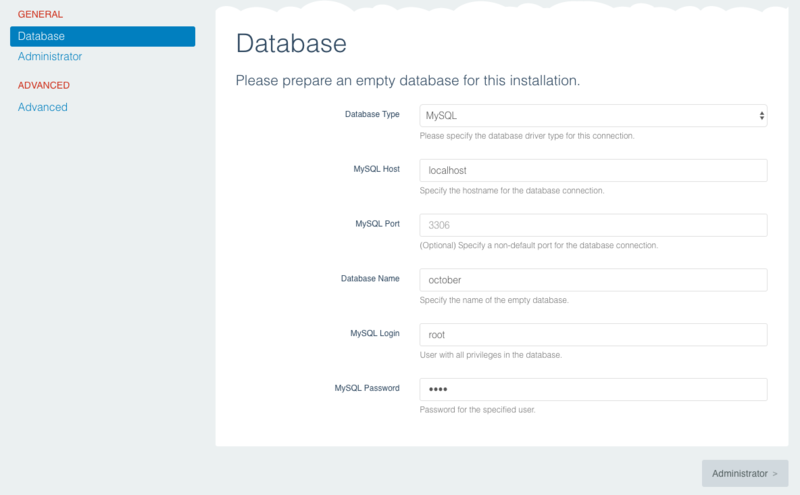 Now, you need to create a database inside the MySQL. So create one database inside phpmyadmin. After that, navigate to the octobercms’ database configuration page and fill the details. After filling all the information, click the Administrator button. 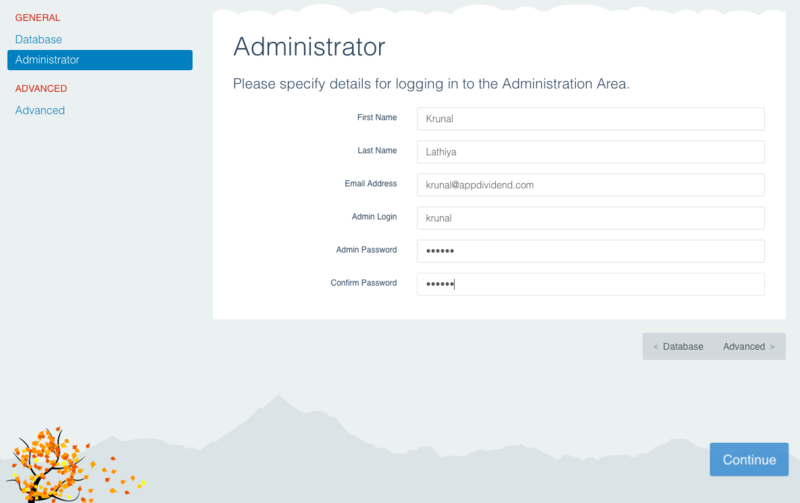 Now, fill the administrator details. After clicking the continue button, you have three options. For this demo, let us start with Start from scratch option. Now, you can see that our installation process has begun. Finally, our installation has successful, and you can see that we got the two URLs — one for frontend and one for the backend. 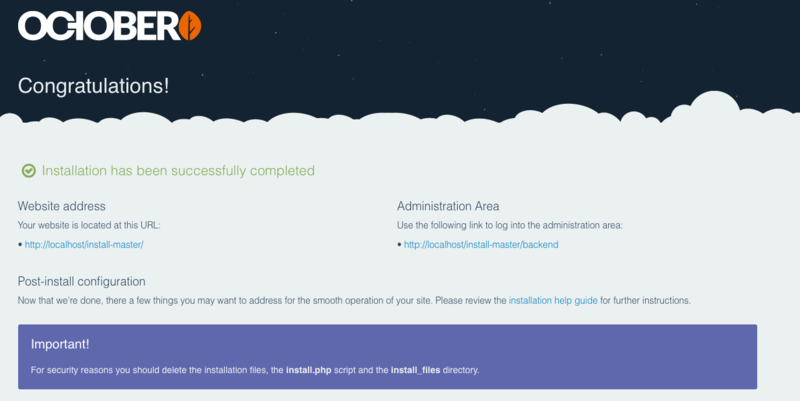 Finally, How To Install October CMS on Mac tutorial is over. Thanks for taking. how to change October default theme ?